A Computer Network can have various types of Servers. A Server is a Computer with Higher Configuration and Authorities. It is used as a central device for connecting other computers and devices. It responds to the requests of clients or other computers connected in a network. Server works on Client Server Networking Model. All World Wide Web (WWW) or internet works because of Servers. Servers provides us files, documents and downloads over the internet. Web Hosting Server is a Server which serves webpages to us due to which we can browse the whole web. File Server: File Server is a Server which is used to host the Files or to save the files in it. These files can be shared to the users connected in the network. In File Server, a user has to log on with some credential information in order to access files and folders. In File Server, Network Administrator or Technician can set various permissions to various files and directories. We can also assign access to some specific computer or client for some specific Folder or File. File Permissions can be Read, Write and Execute. Mail Server: Mail Server is a Server which is used for Electronic Mails. We use EMail everyday. Our E Mails works on the Mail Servers by Google (GMail) and Yahoo. A Mail Server uses SMTP (Simple Mail Transfer Protocol) for sending email messages and IMAP or POP3 for receiving email messages. POP3 is built in the same manner as Simple Mail Transfer Protocol. Web Server: A Web Server is a Server used by Websites on the internet. It serves web pages and many other kind of services to users. An application program is used to communicate with Web Server, known as Web Browser. Now a days, Web Servers are being more powerful with more features. They supports various protocols such as: SMTP, FTP and HTTP etc. The owner or Administrator of Web Server can assign various permissions to any Webpage or File. We can upload files or download files from and to a Web Server through FTP and HTTP. DNS Server: The DNS Server is a Server which is used to find IP addresses of Domain Names. Every computer or Server connected to internet has a unique IP address. We can only communicate or connect with it by knowing its IP address. But as their are too many Websites having different servers so as different IP addresses. It is too hard to remember their IP addresses. To minimize this, we uses DNS server, which converts Website's address like: www.WikiForU.com into its IP address. DNS stands for Domain Name Server. 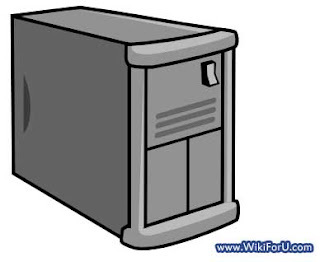 Database Server: Database Server is a Server which is used to store Data. It gives advanced features for Data storage and data analysis. It is most secure way to save files. Many languages like MySQL are used to communicate with database servers. Proxy Server: Proxy Server is used to connect to another Server or Host anonymously. It is used to hide identity of your own host or computer. If you are using a proxy server then all your requests goes through the Proxy Server and proxy server is then connected to the other server or client. Time Server: Time Servers are simply Servers used for providing Standard Time on the internet. These servers are used for synchronization of time and date according to the locations and time zones.